1) When was your 1st visit to the RIAO? Our first appointment was June 13, 2011. Emma was 7 weeks old. 2) Why did you choose the RIAO? My husband and I researched our options because with Emma’s condition only a handful of Pediatric Orthopedics advocate for limb preservation and lengthening. During our first appointment, we had many questions and all were answered beyond our expectations by Dr. Standard and Dr. Herzenberg. We felt like family because of the concern and encouragement demonstrated by the outstanding staff at RIAO. Their pride of working for RIAO was evident as they enthusiastically introduced us to the rehab staff; encouraged us to speak with other families who were there at their own appointment; and taking us on a tour of their facility after a very long day. The complete transparency solidified the important life changing decision we were making on behalf of Emma as we began this scary journey. This was confirmation that making the commitment to travel from Orlando to Baltimore was exactly what we needed to do. After this first visit, it was an easy decision for Tim and I to decide that Dr. Standard would be our first choice. 3) What is your goal for Emma's treatment? Once we had decided to go with limb preservation and lengthening, our first step was to stabilize Emma’s ankle. She had her 'Super Ankle' procedure at 1 year old and most recently in Feb. 2014 at almost 3 years old, Emma began her first leg lengthening. We have just lengthened 5 cm. 4) How many surgeries has she had? Emma has had two surgeries. 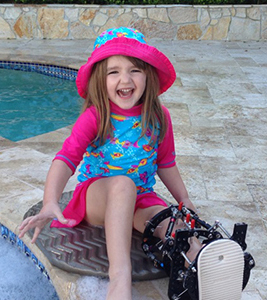 At 1 year old she had the 'Super Ankle' procedure and tibial straightening. Her most recent surgery was in Feb 2014. She began the lengthening procedure and had a plate put in her knee to correct for her ''knocked' knee. She has already achieved 5 cm of lengthening, and a portion of her ex-fix has been removed. Her entire ex-fix will be removed in August 2014. 5) How many times have you traveled from FL to MD? We have traveled at least 12 times that I can remember and one of the trips we stayed for a month (in Feb 2014 when she had her most recent lengthening surgery). 6) Why do you participate in the Save-A-Limb Ride? We participate because we need to bring awareness to limb deformities and to help families not only have a support network but also to help others who cannot financially afford these types of limb preservation surgeries. We want to help other families realize that there are alternatives to amputation and that their child does not have to lose out on his/her childhood. Every child should be able to just be a kid! One of the arguments that we were told against continuing with limb lengthening is that Emma would always be in the hospital and she would never be able to run and play like other children her age. Well, Emma has been in the hospital for a total of 10 days her entire life and if you ask anyone who has ever met Emma, they can tell you that NOTHING stops her. Even if they have only met Emma while wearing her ex fix, she is literally chasing her little sister and cousins around. She is always on the go! 7) Tell us about your team: Money raised, how many team members? Our team is 'Emma's Entourage' and is primarily made up of our family because we have a rather large family. For the 2013 Ride/Walk, we were 27 strong, and lucky for us, some of the family was able to fly to MD to participate, and we also have family that lives in other parts of MD as well as some in the Baltimore area that enthusiastically joined us as well. Our first year (2012), we raised over $15,000 and last year (2013) we raised over $21,000. We have raised some money through the support of local businesses but most of the money is simply from word of mouth… friends, family and co-workers. I am a physician at a local hospital and have an amazing and very supportive staff who have generously donated money or purchased t-shirts and wristbands that we have sold in support of 'Emma's Entourage'. The nurses are truly amazing and it has been their strong effort that have helped us succeed farther than I could have imagined. Tim and I decided to start a website to bring awareness to congenital limb deformities, most specifically to Fibular Hemimelia by telling our story. It focuses on our journey as a family and how we have made it to where we and Emma are today. It starts with our diagnosis in utero and all of our orthopedic consults and appointments at RIAO and other facilities, and gives insight to why we chose leg lengthening and why we chose Dr. Standard and his team. Our goal for our website is to be more of a resource for families going through similar situations. Linking families together and being a means of support for families through a support network and a platform for questions and answers that can help families during this difficult time, was important to us. We realize when a family is faced with the difficult decisions and treatment options for limb discrepancies there is lack of positive advocacy presented by most orthopedics. We want to be the resource to facilitate options. We are not wanting to give advice but rather present options! 9) Any suggestions/advice for other families? Go with your heart… that is how you know you are making the right decision. Tim and I weren't sure what to do until we came up for our first appointment with Dr. Standard at RIAO. 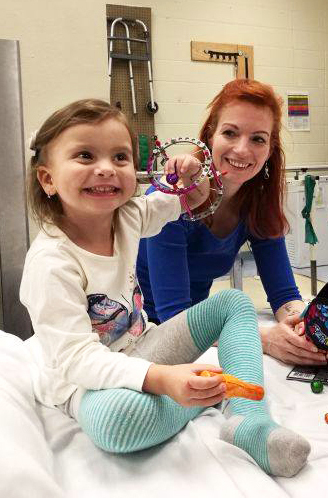 We had seen multiple orthopedics from both sides of the spectrum but still were unsure and unsettled in what would be the best option for Emma. After the appointment and meeting Dr. Standard, Marilyn Richardson, the best patient advocate we have ever met, and all of the other staff members, we knew what our decision was for Emma, and exactly where we were going to have it done. It felt 'right' and we knew that each and everyone involved in Emma's care was treating her like she was their child and what was in her best interest. The most extraordinary part of Dr. Standard and the RIAO team is not just medically achieving the lengthening goal, but looking at Emma as a young growing little girl, and considering her emotional and psychological wellbeing and choosing the best outcome for her life. 10) Anything else you would like to include. Dr. Standard and RIAO not only treat their patients and parents with concern and respect, but also the extended family... we always travel with a crowd :). Grandparents are viewed as the supporting family unit and explanation of the entire process is discussed so everyone knows what to expect and how to help the parents and siblings during this family journey. My husband and I learned about Reilly's condition when I was about 5 months pregnant. We were referred to a neonatologist who we saw every few weeks until his birth for tests/scans and measurements through ultrasounds. She then referred us to a pediatric orthopedic surgeon, but the meeting did not go well. Then, during an interview with our pediatrician, Dr. Shawn Standard's name came up in conversation. He said he had never met him personally, but had heard great things. We first met with Dr. Standard when Reilly was only about one month old. During the first meeting, we instantly knew we were in the right place! It was clear that Dr. Standard knew what he was doing/talking about and that he truly cared. Reilly was born with unilateral PFFD (Proximal Femoral Focal Deficiency), also known as CFD (Congenital Femoral Deficiency). It is a birth defect affecting the pelvic area. In Reilly's case his right leg is affected. When he was one, he had his first surgery, the SUPER hip surgery. In short, this was a reconstruction of his hip. Thankfully everything was there, but it had formed differently due to the lack of a femur bone. He was in a spica cast for about 10 weeks total (6 permanently and then the last 4 it was made into a removable cast which he had to wear any time he tried to stand, walk, roll, etc). The SUPER hip surgery consisted of placing pins in his ankle to stabilize it, and repairing his knock-knee. Approximately one year later, he underwent another surgery to remove a plate from his hip and to have a rod inserted in his femur to stabilize it until his first lengthening surgery on February 11, 2014. In that surgery his femur bone was surgically cut and an external fixator with nine pins was placed in the bone. He wore the ex-fix from February through early September 2014. To lengthen the bone, we used an Allen wrench to turn the lengthening bar 1/4 turn, 3-4 times daily until May 22, 2014, when we stopped turning to let the bone heal. The lower half of his fixator was removed on July 25, 2014 and the remaining parts were removed on Sept 5, 2014. When the remaining ex-fix parts were removed, they placed another rod into his femur to stabilize the bone. On July 31, 2015 he will have that femoral rod surgically removed and an eight-PLATE will be screwed into the growth plate at the top of the tibia. While in surgery they will determine if a second eight-PLATE needs to be placed at the bottom of his femur. Throughout the lengthening process (and post-op) Reilly had to go through months of grueling physical therapy, both in water and on land, which was very painful at times. It was definitely not easy for him, but he pushed through it like the little super hero that he is! The July surgery will not be Reilly's last procedure. He will have at least two more femoral lengthening surgeries and possibly a tibia-lengthening along the way with minor maintenance surgeries in between. The next lengthening will take place between the ages of seven and nine, depending on his growth, and then the next when he is in his pre-teen years. Throughout this journey we have met so many amazing, supportive, thoughtful people! Without them I am not sure we could have made it through these first four years of Reilly's life. Reilly is loved by so many. He has experienced things in his short life that many people do not in their entire lifetime. He is so brave and strong, and a true inspiration to us and many others. We love him so much and are so proud of him, and so thankful that through all of this he still continues to shine! The Save-A-Limb Fund has been a lifesaving resource for us. Early last year, Reilly had his first limb-lengthening surgery. Our insurance only covered the first 35 Physical Therapy sessions and Reilly needed more than the allotted amount. He was initially going five days per week and had the external fixator on for the better part of last year. We could not afford to pay for all of his therapy sessions out of pocket, so the Save-A-Limb Fund stepped in to help us with a portion of the cost. We want to give back to the SAL Fund so that other patients can also benefit from the assistance it provides. We started participating in the annual Save-A-Limb event and this will be our third year! Luke had been home from Ukraine a short while. We first went to Shriners and met with two of their doctors to evaluate his orthopedic needs. He was born with his right leg fully attached to the middle of his back and his left leg was webbed with a club foot. We were not settled with their suggestions for helping Luke, so we sought out another surgeon - Dr. Sponsellor at Johns Hopkins. His suggestion was also to amputate Luke's leg. We again did not feel this was exactly what we wanted for him, so we sought out another opinion. We had a consult with the head of orthopedics at Children's National Medical Center in Washington, DC. She told us Luke's case was too much for her to handle, but she knew where we should go...and that was to Dr. Standard at RIAO. We met with him and were delighted with Dr. Standard and all of the providers and caregivers for Luke there. Because we are such a large family, sometimes the cost of medical equipment is difficult for our budget. The Save-A-Limb Fund has provided a walker and other medical items for Luke and his sister, Mya. Specialized braces and training for PT was given so that we could provide better care for him at home. We could not do what we do without the generous support and encouragement from all of the staff at the RIAO. We have several children with medical needs and getting the necessary medical care - visits and equipment - has helped us tremendously. We feel a strong connection to Dr. Standard and his family as well. They have gone above and beyond to support our family in so many ways. The entire RIAO staff has been compassionate and understanding of some of the different needs that a very large family has. Our visits to clinic, or surgery, or even the stays on the floor post-op have all been positive. Managing a child in an ex-fixator can be difficult, but the support of the team at the RIAO is amazing. We love everyone on the team and feel very blessed to have them in our lives as medical providers, as well as friends. We hope to be at the 10 year celebration in October, mostly to show and share our support of a life-changing organization, the RIAO and the Save-A-Limb Fund. They have been so generous with their financial support, as well as emotional support, to our family. We would like to give them our support and love for all they have done for the members of our family. They have made such a difference, especially in the lives of Luke and Mya. We are grateful that we listened to our "inner heart" and kept getting second opinions until we met Dr. Standard. When it became apparent that our son, Sean, now 15, needed an orthopedist to follow his development, the only doctor I would consider was Dr. Herzenberg. While people spend hours doing research to determine that he is “the doc”, our story is a bit different. I had the privilege of working professionally with Dr. Herzenberg while employed as a physical therapist at Kernan Hospital in the mid 1990’s. There, I was witness to his genius. I met many patients who traveled far and wide seeking out his medical expertise - families whose children had congenital anomalies, people who had an injury to a limb who were told by their local doctor that the only solution was amputation, and people who had dwarfism trying to decide if lengthening to make them taller was really a viable option. It was amazing to watch him evaluate and treat these patients with individual and unique needs. None of the procedures could ever be exactly the same. I was in awe. Furthermore, there was never an “I” in the TEAM of professionals that treated his patients - the patient, nurses, therapists, transport staff, CNAs and family members were always treated with respect and valued as part of the TEAM treating the patient. In 1999, our son was born approximately six weeks early and had sustained a stroke in-utero with ongoing right hemiparesis. When he was eight months old, we were told he might benefit from an orthopedic evaluation. We started at Kernan and transferred over to the Rubin Institute at its inception. Over the years, Sean has undergone BOTOX injections, tendon transfers in his leg and arm lower extremity, and management of a leg length discrepancy checked annually to ensure proper growth. He is currently being treated for poorly aligned femur and tibia bones, and will have de-rotation osteotomies to both this summer. All of this treatment has been in the very capable hands of this amazing surgeon. BUT, Dr. “H”, as Sean calls him, is not just an amazing surgeon. He is a caring, compassionate visionary who is extremely humble about his extraordinary capabilities as a doctor and as a person. When our younger son was diagnosed with Type 1 Diabetes and was admitted to Sinai, Dr. Herzenberg took time out of his very busy orthopedic rounds with patients to stop in to say hello and comfort us all. He even donated to our “RIDE to CURE” effort that raises money to find a cure for Type 1. We were unable to participate in the Save-A-Limb event the inaugural year because Sean could not ride a bike. A few years later, he was riding a recumbent bike so we rode the 6 mile family ride with my husband towing our toddler. A few years later we all rode the family ride, sharing stories with other families as we pedaled the 6 mile course. Last year, the kids had sports commitments so instead of the family ride, my husband and I had a wonderful morning riding 30 miles through the country roads of Baltimore County in honor of our son, Dr. Herzenberg, and this fabulous organization called Save-A-Limb. When asked how I first found the RIAO: My first appointment was on 12/24/1992 when I was 16 months old. My mom brought me to Kernan Hospital and the International Center for Limb Lengthening & Reconstruction after seeing a medical segment on ABC’s “The Home Show” about a revolutionary technique called Limb Lengthening that was being performed there. She had been vaguely told that this procedure might be something in my future but not to bother looking into it as I had to finish growing first. Faced with doing a procedure to “bide us some time” after I turned one, she decided to go hear what a place that focused on this procedure had to say. I became a patient immediately after that visit. When the center moved from Kernan Hospital to Sinai Hospital and became RIAO, we went right along with it. I am now finished with my lengthening journey, but try to return to see Dr. Standard, when possible, to monitor the long term effects of my procedures. When asked why I support SAL: My mom and I are very big advocates of the concept – Pay It Forward. The compassion, support and genuine caring from Dr. Standard and his staff, Marilyn Richardson, Anil, Erin and the entire Physical Therapy staff, Amy and Bill at the Hackerman Patz House, and the camaraderie of the many families we have connected with over the years has meant the world to myself and my mom. There really isn’t anything we wouldn’t do to help them or any family traveling down the road we have already successfully navigated. My mom always said “if we can help make just one other family’s journey one step easier by sharing what we have learned, then it gives our journey that much more meaning and purpose.” Supporting SAL is just one of the many ways we try to “give back” some of what we have been given. When asked what I will be doing this year to support SAL: We support SAL in many ways. We are, once again, members of team RIAO and have a fund-raising page in my honor to raise money from family and friends. Since the very first SAL event 10 years ago, we actively volunteer to assist Marilyn Richardson with whatever she needs help with the entire day before, the morning of, and at the event dinner in the evening. I will also, once again, have the honor of walking along side my mom and my very first nurses, Pam Lentz and Pam Wilson. They have all been a constant source of comfort, love and support over the past 24 years and will always have a special place in my heart. Micah Summey has been a fighter since before he was born. He had a broken femur while in his mother’s womb and beat the odds by surviving birth. Doctors initially misdiagnosed Micah with Brittle Bone Disease but Robert and Joanna, Micah’s parents, were determined to get a second opinion. At the recommendation of another physician, when Micah was 3 months old, the family loaded him in their car and drove from their home in West Virginia all the way to Sinai Hospital in Baltimore to meet with Dr. John Herzenberg. Dr. Herzenberg is the Director of the International Center for Limb Lengthening and Director of Pediatric Orthopedics at the Rubin Institute for Advanced Orthopedics (RIAO) at Sinai Hospital. They wanted the best care for their son and knew they were lucky that the best was within reach. It was at the Rubin Institute that Micah was properly diagnosed with Proximal Femoral Focal Deficiency (PFFD), which affected his right femur. The family was thrilled to have a diagnosis that was treatable with limb lengthening, a specialty in which Dr. Herzenberg is world renowned. Dr. Herzenberg worked to create a plan of action to equalize the LLD, and shared his philosophy with the family that Micah is taking this challenge head on. The family would see Dr. Herzenberg once a year until Micah turned 3½ years old and could have his first surgery. The surgery was on his hip to address the PFFD – a rare, non-hereditary birth defect that affects the pelvis, particularly the hip bone, and the proximal femur. The disorder can affect one side or both, with the hip being deformed and the leg shortened. Micah handled the surgery with courage and resilience. After his first surgery, the family was introduced to the Hackerman-Patz House (HPH). The HPH is a comfortable and convenient place to stay—a home away from home that provides short and long term lodging for patients and their families. The Summeys first stayed at the house for a week while Micah was recovering from his surgery at the Herman and Walter Samuelson Children’s Hospital. While in the Children’s Hospital, Micah loved the live stream of sea life from the Baltimore Aquarium. Watching the fish made him smile. The family loved the HPH because it was on the Sinai Hospital campus and in walking distance to the Children’s Hospital. Micah’s little sister, Kaleigh, would need naps during the day and the close proximity of the hospital to the house meant they would not have to leave Micah for an extended period of time. The second trip to Sinai, the family stayed at the Hackerman-Patz House for 2 full months. Micah was admitted to the hospital for a limb-lengthening procedure that applied an external fixator to help lengthen the bone. Once discharged, he had to go to physical therapy 5 times a week. The family had opportunities to ask Dr. Herzenberg about recovery and what happens when you go home. Dr. Herzenberg introduced them to other patients who would be able to describe what it would be like from a parent’s perspective. The Summeys would also get to ask other patients about their stories and learn from their triumphs as well as their struggles. They found this extremely helpful and credit the doctors and support staff for encouraging an environment of sharing between families. The Summeys adore Dr. Herzenberg and the families they met both at the HPH and RIAO. The family also loves Marilyn Richardson, Pediatric Liaison at the RIAO, and Amy Scholnick-Powderly at the HPH. Having them as resources has made a very difficult time, a little easier. Micah’s next surgery will be in a few months to get his fixator off and have a rod inserted into his leg. He will then have to have another surgery because his toes are fused together. He will continue to have limb-lengthening surgeries until his body is fully grown. Micah just celebrated his 4th birthday with a Scooby-Doo themed party. When you ask his parents about their hero, they immediately respond with “Micah!” He is an amazing, outgoing kid who flirts with all of the pretty nurses at Sinai Hospital. And if you are not careful, he will steal your nose when you aren’t looking. Please join Micah and his family on Saturday, October 10th at the 10th Annual Save-A-Limb Fund Fest. The event includes a 6 mile and a 20 mile bike ride, a 1 mile Make A Difference Walk and a children’s obstacle course. All proceeds from the event benefit the Save-A-Limb Fund. Barb McKee of New Jersey is an accomplished rider who came to the RIAO seeking a solution for her hip pain that would help her get back on the road. McKee has been an athlete all her life. She was a member of the U.S. Whitewater Team and a marathon runner before she switched to biking as a low impact outlet for her competitive urges. She joined the Century Road Club of America in 1990 and has raced at the club level for two decades. She is also a serious touring rider, having completed long treks throughout North America and Europe along with her husband, Rick. In 2006, at age 60, she completed a cross-country ride in 32 days with her husband and two friends, members of her regular touring group. After her transcontinental adventure, she took on a construction project at home that had her carrying heavy materials into and out of the house in cold weather. The pain became significantly worse. During the winter of 2007, McKee began experiencing pain in her hip. She had dealt with hip pain previously, but it was attributed to a spinal problem, and passed without treatment. She continued to take a wait and see approach. Months passed and in August of 2007, after x-rays by a local orthopedic specialist, she received a definitive diagnosis of osteo-arthritis of the hip. McKee immediately began researching treatment options that would alleviate her pain and get her back to her active lifestyle as soon as possible. Mont (also an avid rider) met with McKee and advised her that she was a strong candidate for resurfacing. The surgery in February 2008 went well and within 3 weeks McKee was soft-pedaling her bike on an indoor trainer and chomping at the bit to get back on the road. Amazingly, six weeks after surgery, McKee rode nine miles to her first post-op physical therapy appointment (much to the surprise of her therapist!). She eased back into road riding, gradually increasing distance and effort. She began racing again in time trials with her club just ten weeks after surgery and at six months postop, McKee and her husband rode from Pittsburgh to Washington, D.C. in five days, averaging around 75 miles a day. A month later, she took on the hilly, challenging 100km "Save A Limb" ride which Sinai Hospital organizes each October as a fund raising effort for the RIAO. McKee encourages cyclists to carefully consider hip resurfacing if they encounter recurrent pain, but she cautioned that many orthopedic surgeons may not even mention it as an alternative to joint replacement. McKee has since referred her sister and other family and friends to Dr. Mont for treatment. Many have also had hip resurfacing done and are equally thrilled with the results.